Disclosure: I partnered with Land O’Lakes for this Jambalaya Pasta recipe post, but all opinions expressed here are my own. I am grateful for authentic partnerships like this. 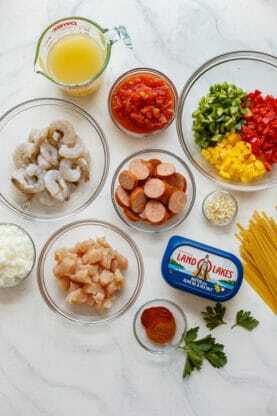 Cajun Jambalaya Pasta Recipe – A quick and delicious one pot meal complete with cajun flavors, creole spices, shrimp, chicken and so much more! Now exactly what is Jambalaya in the first place? 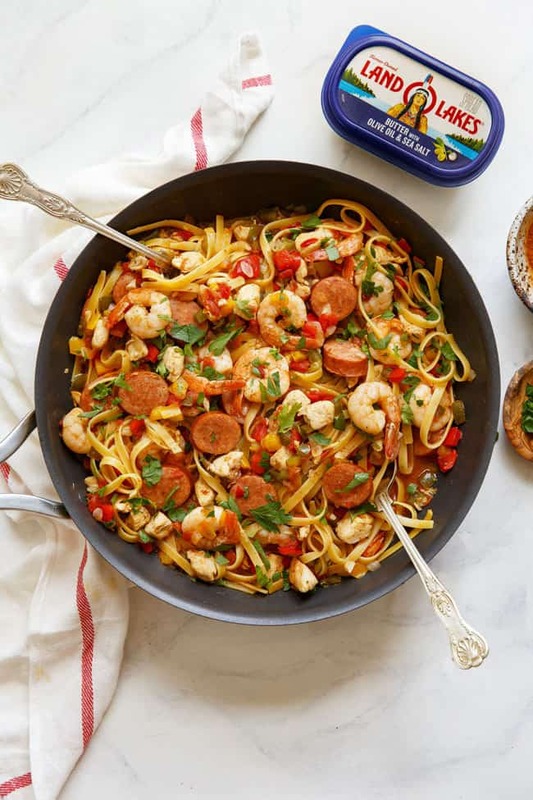 Jambalaya is truly the quintessential Southern one-pot recipe; the aromatic Cajun and Creole spices combined with andouille drippings, fresh vegetables and delicious shrimp and chicken make for the ultimate comfort food. If you have ever tasted this dish in New Orleans, then you know how truly special it is. But just as with any other staple dish, sometimes you just need to add a twist! If you love the bold flavors of jambalaya and the rich texture of pasta, this recipe is for you. 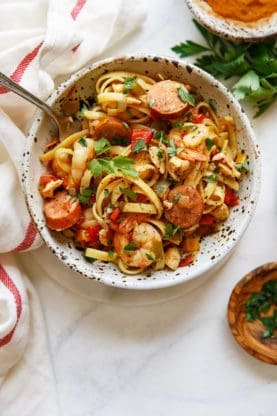 This Cajun Jambalaya Pasta recipe is quick and easy, meaning you’ll have an incredibly flavorful dinner on the table in no time. Most have never experienced making an easy jambalaya but this recipe is the best way to achieve that. I love to throw this together on a weeknight when I’m absolutely exhausted but still want something homemade. Now, there are two things that make this recipe amazing. First, of course, it’s all done in one pot. That’s right! Just one. 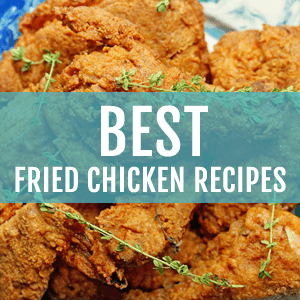 So bust out your grandmother’s old cast iron or your favorite stainless-steel and get cooking! One-pot cooking is great for batch cooking if you’re in need of leftovers, and it also allows the flavors to really build together. The second thing is the addition of Land O Lakes® Butter with Olive Oil and Sea Salt. It’s so creamy and infused with rich flavor. The taste is also incredibly pure due to it only having four ingredients: sweet cream, olive oil, salt and sea salt. That’s it my friends! No ingredients you can’t pronounce, or never heard of, make their way into this product. 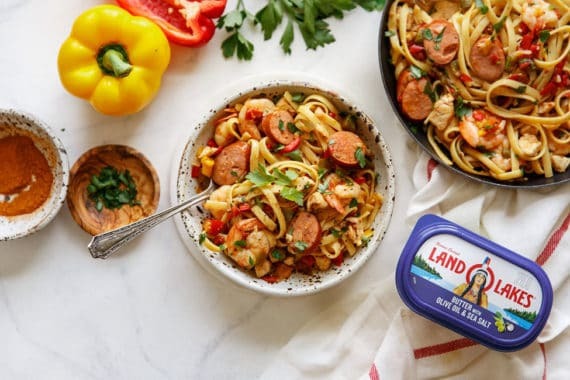 Land O Lakes® Butter with Olive Oil and Sea Salt adds subtle flavor while also lending its hand in the smooth texture of your pasta; there’s no way you could go wrong. Now for the additional flavors. 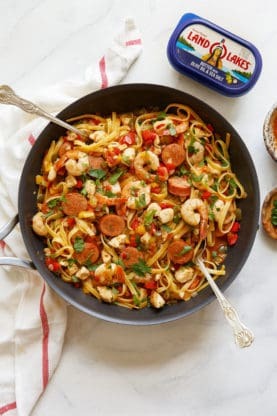 Some like just a chicken jambalaya or a shrimp jambalaya but I like to combine both, along with andouille sausage, in this pasta to really give additional essences in every single bite. To add that great flavor, you need to go with a wonderful Cajun spice. Be sure you check the sodium level to prevent your pasta from being too salty. I love to also add a bit of paprika for more spice and color. Lastly, I love fettuccine but you can go with any pasta you love for this. Depending on the pasta you select like in this cajun shrimp pasta recipe, it can really soak up more of that glorious sauce. Now, with all that being said, go ahead and get going on this delicious bowl full of Creole! 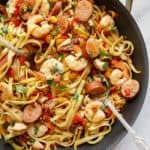 Cajun Jambalaya Pasta Recipe - A quick and delicious one pot meal complete with cajun flavors, creole spices, shrimp, chicken and so much more! Add Land O Lakes® Butter with Olive Oil & Sea Salt to large pot over medium high heat until melted. Add chicken pieces and lightly season with salt and pepper. Cook until no longer pink. Then add sausage, onion and peppers to pot and cook until vegetables are tender. Stir in shrimp and cook until barely pink. Next add garlic and cook for about 30 seconds then toss into the rest of the ingredients. Pour in chicken stock and diced tomatoes and lower heat to medium. Stir in Cajun spice and paprika and cook over medium heat reducing ⅓ of the liquid. Toss in cooked pasta making sure to coat with sauce. Taste and add additional salt and pepper if necessary. Garnish with parsley and a sprinkle of Cajun spice and serve. 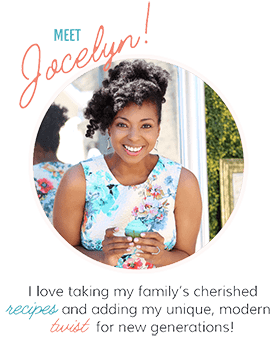 I saw you featured in All recipes and immediately became a fan. 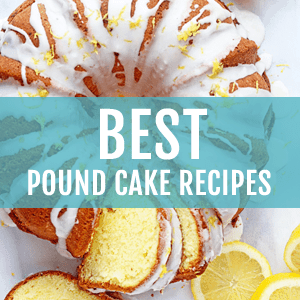 I am trying this recipe and you lemon poundcake. You have a new fan. Awww thank you so much!!! Hooray! Love this delicious twist on dinner!!! 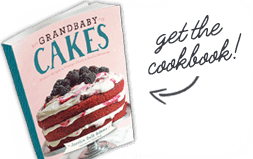 This looks like a great addition for weeknights! This looks like on EPIC cajun dish! 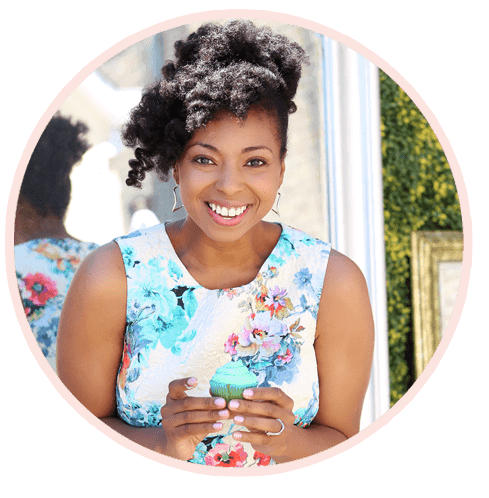 I love jambalaya…can’t wait to try your recipe! 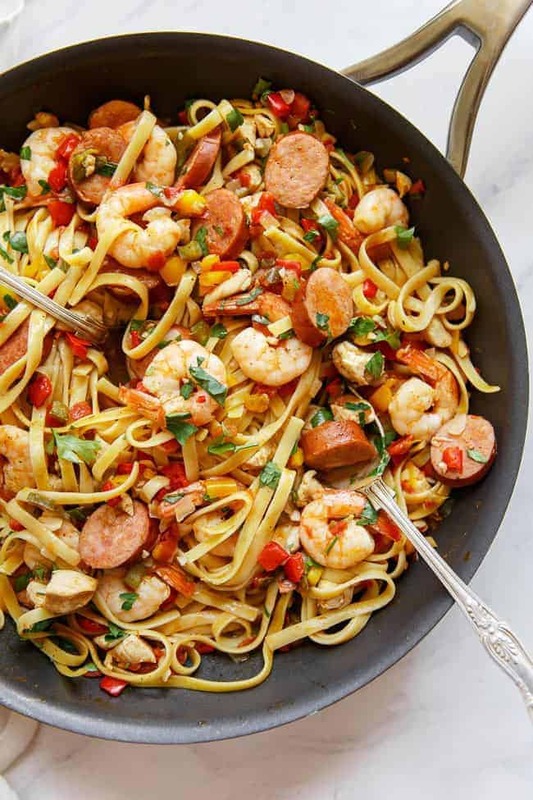 All of those delicious Cajun jambalaya goodness AND pasta! What a delicious and heart meal!